This month I got the clear message that my blog needs to be about mindfulness, practice, finding our inner genius, and why any of this matters to you. Specifically, what I want to relate the experience of mindfulness. What it is like to live from within. Mindful living is making choices and decisions using intuition. Living from a connection to a universal consciousness. The biggest and most important difference around how plans and decisions are made, I no longer look outward when deciding my next step. I am not taking the temperature of friends, family, or colleagues or listening to mass or social media. Decisions come from within, and they come in the moment. Choosing to live a mindful life begins a conversation, a conversation with yourself, your soul. It takes time to master the flow of this conversation. There is less doing, and more being. It requires regularly getting quiet and listening to your body, mind, and soul. Learning to tap into your inner genius, experience the moment, know that there is no wrong decision, and letting intuition (inner genius) guide you to the next stepping stone. It is having a destination in mind, aiming for it, moving towards it and then dropping all attachment to how you get there when you get there and sometimes if you get there. Please note that just because there are no wrong decisions, doesn’t mean life won’t turn upside down and get ugly once in a while. It just means that even if it does get ugly, I know I will be ok. I will find my way out of it. I will know why it happened by what it taught me about myself. Decisions and plans are made by following the intuitive yes, the path of ease. If something is too hard, I need to stop and reflect. Why is it hard? How is it hard? Am I following the intuitive yes or am I pushing my own agenda? Mindful living asks for an almost constant process of letting go. Letting go of the plan, letting go of the timing, letting go of what I thought I wanted. The Universe will use any opportunity to lead me back to my true path, the path my higher-self chose and has nudged me towards my whole life. 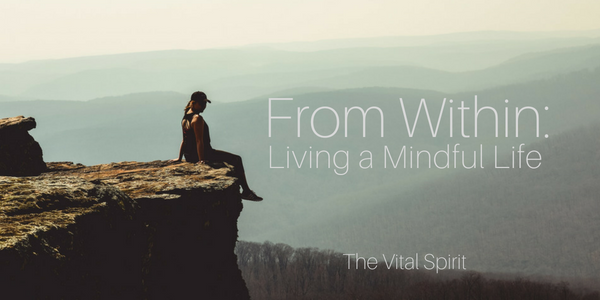 It will bring people, situations, and opportunities into my experience that consistently and relentlessly push me back over the path I claimed when I began to live mindfully. The harder I fight against these course corrections, the longer it takes and the more difficult the journey. Becoming aware of how and when life gets difficult offers our first experiences of intuition and the opportunity of to start that conversation with your higher-self. How do you follow the intuitive yes? Glad you asked. Intuition is very subtle energy, and you first need to learn how to read it, hear it, see it or know it. The intuitive “voice” is quiet and often it does not offer the advice or instruction one would have expected. It is easy to confuse intuition with desire or fear because those feelings are louder. Discerning intuition when in the presence of desire or fear takes time and practice. In order to hear it properly, you must learn to get quiet. And this is where a mindfulness practice comes into play. Mindfulness is a broad term for a variety of activities that help you tune into your own experience of the moment. How am I feeling at this moment? Why am I feeling this way? Where in my body do I feel it? When did the feeling start? What would better serve my goals and dreams at this moment? A mindfulness practice develops the ultimate conversation of our lives, the conversation with your soul, or higher self, or God. As a practice, mindfulness includes meditation but there are also many other types of practices. In fact, there are as many ways to practice mindfulness as there are people on the planet. There is walking meditation, prayer, Transcendental meditation, journaling, reading, yoga, running, drawing, writing and so on. The goal is to find what works for you. It is important to keep your basic nature in mind when choosing, it can be difficult if you are an active person with a busy mind, to try and follow a strict style of meditation that requires a still body and an empty mind, particularly when you first begin. So go easy on yourself, experiment and choose a practice that can bring you some success. Success, you say, what is a successful mindfulness practice? There is a mystique to spiritual practices that intimidate newcomers. The phrase I hear a lot from clients when discussing meditation specifically is “I don’t know if I am doing it right.” I vividly remember feeling, thinking and saying the same thing when I began meditation, yoga, or what have you. There aren’t any concrete milestones in these practices that give us the feedback we long for until the practice takes hold. There aren’t any gold stars or A+ quizzes. And let’s face it, any type of mindfulness practice is diametrically opposed to our “normal” everyday existence, where we are overstimulated and our minds are full of tasks and lists. Each practice is individual and the results are ethereal, the more we try to describe the feelings and experiences the less value they hold. Achieving even one of these three aspects during any given mindfulness session is a success. You don’t need to see beautiful visions, feel the hand of God, hear angels singing, or achieve perfectly balanced chakras. Like any activity, practice brings out the magic. My nieces are learning to play instruments and for one niece the concept of practice was easy and enjoyable, for the other, she believed she needed to be great at it from the very beginning (she gets this from yours truly) and it took time to persuade her that she was supposed to struggle at first. That anything can be learned through practice and it is through practice that we gain confidence from our growth and achievement. In practice, we are discovering our own inner genius, or intuition, as we begin to personalize our practice through the expression of our own soul. My older niece chose the guitar for her instrument and the younger, the piano. These instruments will be their vehicles for self-expression and communion with music. A mindfulness practice can be the same as learning an instrument, find the right instrument (mindfulness style), practice regularly, add your own genius (intuition) to it, and express the music (Soul) within you. Why do you care about mindfulness? Well, maybe you don’t care, but for as long as I can remember, I have been restless. I have had a nagging feeling that what I was doing with my life wasn’t enough. I was dissatisfied with my relationships, my work, my leisure, nothing felt good, nothing felt fulfilling. I consider myself a curious woman with above average intelligence and I was bored and a little terrified that I was missing the point. Spirituality allowed my inner genius to bloom and I found “the point.” Mindfulness is how I experience my spirituality. It is the activities and routines through which I explore life, myself, and my relationships with friends and family. I am rarely bored, though at times I am still restless. It is through mindfulness that I have lived with passion, energy, love, joy, and all the beauty one could hope to find in the world. Let mindfulness begin the conversation of a lifetime.